I like third grade. I really like my teacher. He is really nice. Pretty much all the stuff is easy. He has a lot of computers! I have a blog! I like art. I can not what until Halloween! I am going to be a dead princess. Creepy. I am going to have fake blood running down my cheeks.I hope Halloween will be fun. My principal Dr. Coram has really fixed this school up so much. I miss her really bad. I hope she gets better soon. So she can come back. Hope her surgery makes her better. My mom is really nice. She goes out of her way to do stuff for me and my family. She is really generous.If I am sad she cheers me up. My soccer team is called girls rule boys drool. My coach is really nice. We had pics taken last weekend. We have not won a game yet but we are going to. The people are really nice. I am going to my soccer game on Saturday. And going to the movie store to by lots of movies for Sunday. And on Sunday I am going to stay in my pajamas all day and watch movies with my dad. My Halloween plans are I am going to be a dead princess. On Halloween it is going to be so fun. I am going to have so much fun! I am going trick or treating with my friends. It will be so much fun. I am going to my friends to go trick or treating. But I am going to my other friend’s house first. My sister is so nice. She is 13, so she can be really fun. She goes out out of her way to do stuff with me and I like that. What s on my mind today is what I'm doing after school today with my girl scouts. I hope it will fun. And what my mom and dad are doing right now. Also what I am going to do after girl scouts today. What is on my mind is what I am going to do at my soccer practice to day. My coach is in Russia with his family. I don’t know why? So a girl named Hail has a mom who is teaching us. I play defense. It is really fun. To day is Saturday and I'm going trick or treating with my friend at the Junction. It is going to be so much fun! I love Extreme Makeover Home Edition. Why? because it a show about this crew that goes to people's houses that are bad. And fixes their houses. After they are done the houses look so amazing! And some stories are so sad. Some of them I almost cry. One time this family had a daycare and they had mold and their daughter had asthma. She had to take lots of medicine. It was so sad. Then the crew came and helped them. They had so cool rooms. It is on ABC at 8. It is such a good show! I think it will be close about the election. I hope it will be Barack Obama. I want Obama because he wants to end the war. I don’t want John McCain because he wants to keep the war. And he wants to raise taxes for healthcare and not give money to mothers who are single and need help. Obama won last night! I was very excited and so was my dad. We were looking forward to who was going to be the next president. I did not want John McCain because wanted to keep the war going. But he is not going to be president. And he was going to not give people that needed money. What’s on my mind right now is tomorrow, Friday. And what I am going to do. I hope it will be fun. And also what I’m going to do after school today. I hope it will be fun. Tomorrow we get the day off because it is Veteran's day. I'm going to hang out with my mom. It is going to be so much fun! I am scared about getting my report card. I hope I am doing well in school. It would be bad if we did not have report cards. My parents see our grades. I like report cards because then if you have good grades your parents are very happy. My parents don’t reward me. My conference is tonight. Hi my name is Gobble. I am nervous for Thanksgiving. I live on a farm. I heard my farmer say he wants to eat me for his Thanksgiving dinner. So I went up to the barn. The animals were talking about how they heard about me being the Thanksgiving dinner. They thought of a plan to save me. This is it. The next day I unlocked the lock with my pecker. I ran into the barn. The animals were still asleep. I grabbed the key for the house. I wrote a note to them. It said, “I am leaving”. Then I ran into the forest. Now I am safe in the forest. What’s on my mind today is girl scouts. I like girl scouts so much. It is so much fun. Also what’s on my mind is tonight. Tonight my dad has a person he works for is going to come over to our house. His name is Mike. He is so nice. I am sad about my school might be getting closed. My mom is trying to keep the school open. She is going to all the meetings. I like that. I am so upset because all of my friends are here and also because I was here since I was in kindergarten. I am also upset because I like all of the teachers here too. I do not know where I am going to go. Or all the another students. Once I tried to trick my mom into going out to lunch. It did work. We went to the spaghetti factory. It was good. Another time I tricked my mom into buying me a toy at Target. I got it too. What’s on my mind is the holiday bazaar. I am going with my mom. We backed cookies. On the news it said is was going to snow on Saturday . I really hope it does snow because I like to play in it. I love winter because it is so cozy. I love hot chocolate. I also like to ice skate. But I don't know how to =(. Me and mom and sister make cookies for Santa =). And my friends help me too. There are a lot of teachers in my family. My mom is a teacher, my aunt, my grandpa and grandma were. My mom has to work a lot. My aunt and her classroom sent me a big comment. It was so nice. But the sad thing is that my grandma died. If it snows tomorrow, I will stay and watch movies and play in the snow. It said on the news that it going to snow. My dad has to go to work if it snows. [But if the buses are not working then he will not have to]. I hope that our school is going to be officially off for school closure. They said on the news that it was off the list for school closures. [ But my mom and dad said it wasn't officially off]. I love Christmas. It is so fun. I love presents. My family has a tradition on Christmas Eve. Me, my mom and sister go down to Pike Place Market. We buy crab for crab cakes. They taste so good! My vacation so far has been good. I have been staying home a lot! I am glad that the snow is gone! My dad has to go to work because he does not get winter break like me. It still has been cold and rainy. (And windy.) Me my mom and sister have been going to the YMCA to swim. It is so fun! That's all for now! Bye! My New Years resolutions are.... To not to watch as much TV because it is not healthy to watch a lot of TV. Then to keep on blogging because my blog is important to me. I want to play more sports because it is healthy. I want to eat less junk food because I want to be healthier so I can live longer. Also I want to read more so I can get smarter and I can learn more things. Also I want to do my homework earlier so when I go home I can play. I don’t want it to snow anymore because I want to go home in the summer. The summer time is for swimming, being outside, going to the park, and just having fun=http://=http://=http://=http://=http://!!=(. I am glad it is raining. But last night I could not sleep because of the rain. Martin Luther King Jr. was a really good man. He made it so that children of different colors could go to school together, play together,and just be friends. He is my role model because he didn't fight with guns, sticks, or anything else. He used his words. He give one of the most historical speeches of all time. That speech was, "I have a dream." My dad's birthday was on that day. It was his first birthday. The Inauguration is great. I am glad that Obama got to be president. It is history because he is the first African American president. It was so cool to watch him get sworn in. I am watching a speech about him. I like his daughters Malia and Sasha. Once on Ellen Michelle Obama was on. Ellen gave her a dog house. Dear Mr. President, I am glad that you are president. Are you going to end the war? I like your daughters Malia and Sasha. (And your wife Michelle.) Your girls are pretty too. Is the White House fun? Are you going to have a basketball court? Are Malia’s and Sasha’s rooms big? I have a dream that one day the war will end. And that all the troops can come home. Then everybody will not shoot each other. Then poor people will have like a apartment or something. They should have a lot of food too. There should not be child abuse either. Women should not be hit by their husbands. My plans for the weekend are today I am going to a pajama party. It is going girl scouts. It is going to be so much fun!!!!!!! On Saturday I am going to go to my sister’s basket ball game. I hope her team wins. The rest of the day I am just going to watch T.V. and hangout. I love Fridays because you get to do lots of fun stuff. Like today I am going to go to a pajama party with my friends. We are going to have so much fun. My three day weekend was good. On Saturday I went to my sister’s basket ball game. She won! Then I hung out the rest of the day. On Sunday I went to the west Seattle YMCA gym. I played a lot of racket ball with my mom. Then we went into this yoga room and we hung out there too. On Monday I went to the YMCA Day Care. My friends were there Olivia and Audra. It was fun. My thoughts about the hoop shoot are good. I am not quite done. But my poster is really good. I worked on it with Julian and Hannah. I really like the hoop shoot a lot because you get to have lollipops and you get to play bingo. The bad part is that it is really loud. A lot of kids are screaming. And the whole school is in this small gym. My teacher is so nice. His name is Mr.Ahlness. He is a good teacher because he explans stuff good. We have 12 computers in our room because he knows a lot of stuff on computers. I am glad that he taught us about computers. I am also glad that we have our own blog. I don’t want it to snow any more because if we don’t have it right now it will be our summer vacation. I am so ready for spring because there will be no snow. Also because it is my birthday in April and April is in spring. I love spring=http://=http://=http://!!! What’s on my mind is the field trip. We are going to the Seattle Children’s Theater to see a play. I forgot what the name of it is. My mom is going with the class. She is going to be a chaperone on the field trip. It is going to be so much fun! I am so ready for my field trip. It is going to be so much fun=http://=http://=http://!!!! My mom is going to be a chaperone. We get to pick who we want for the groups. I don’t know who I want to pick. Plus it is the last day before mid winter break. We are going to have a Valentines party. It is going to be so much fun=http://!!! What’s on my mind today is my new indoor soccer team. Today is my first practice. My real coach is not going to be there. I don’t know why. But the girl that is going to be there is nice. Her name is Angie. She works at the y. Also what’s on my mind is my Girl Scouts. I have them today too. It is going to be a busy day. I like my Girl Scouts. Girl Scouts is this really fun thing you do. It is of course for girls. We get to sing songs draw and play games. I am on the girls magazine board. It is so fun. We get to draw pics and they will end up in the magazine. My dad is doing it on our computer at home. It is so cool. What’s on my mind is the snow and the late start. I didn’t want it to snow but it did. I think I know why, because Tuesday made me a snow flake. Also what’s on my mind is the late start. I don’t get why there couldn’t just be no school. I really wish that we could just have no school. On Saturday I stayed home all day. It ended that my aunt, uncle, grandma and grandpa did not come. On Sunday it was my mom’s birthday. We went to my first soccer game we won. Our team name is the Blue jays. It was so much fun! Then after my game we went to Café’ Revo, Maya’s restaurant. It was so good. What’s on my mind is my beetle necklace. It has a real beetle. My uncle got it for me, he loves bugs. He got me this lollipop that has a scorpion in it. It is really weird. My favorite game outside is 4. 4 square is my favorite because it is fun. This is how to play… first you go in to the square number 4, then the person in number 1 square passes it to you, then you try to pass it to a person in number 1, 2, or 3. The object of the game is to get someone out. What’s on my mind is my dad’s eye surgery. I am nervous because what if something goes wrong. It is tomorrow. It is kind of a regular day except for that one thing. Today my dad is having his eye surgery. So it is pretty much going to be me and my sister tonight. I am nervous. On Saturday I think I will see my aunt, uncle, grandma, and grandpa. On Sunday my mom and sister are going to run the St. Paties Day Dash. I get to see my friends after that. I am so excited! It is going to be such a fun time going to Long Beach. But it is going to be such a long time in the car. I am going to read and watch movies all the time. I am going to read Harry Potter. I don’t know what movies I am going to watch? I love going to my Grandma’s and Grandpa’s. It is so much fun. My aunt and uncle were there when I was there. For dinner that night we had halibut and some kind of roast. We also had a taco salad. For dessert we had some pie and ice cream. Me my sister aunt and my other aunt played Monopoly. It was so much fun! My sister and I watched some TV. I went to the goat farm. When we were walking to see the baby goats there were ramming goats in the fields. I got rammed by one. I did not like it. The baby goats are so cute. I hated the WASL. It was not hard. The WASL means The Washington Assessment of Student Learning. I just don’t like it. I don’t even know why we have to take it. Today we are doing reading. Tomorrow we are doing reading too. On Thursday and Friday we are going to do math. I wonder if the math will be hard. I don’t think it will be very hard if it is hard. Today we did math. It was not hard. It pretty much was like the practice WASL. We got to use calculators. I only had to use my calculator once. The snack for today was carrots and cheese sticks. The cheese sticks had little trivia for High School Musical 3. I did not really like them. But they were good anyway. We did not get to have juice like we did yesterday. The juice we had yesterday was really good. I love to have a break during the WASL. I am so glad that the WASL is over. It was not hard. Today for snack we had Ritz with cheese in the middle. It was so good. We could ether have a orange or juice with our Ritz. I went to Port Townsend. I stayed in this place called Kala Point. It has a pool. I love the pool. I love it there. There is this book story called Books. I got a book from there. I forgot what book it was. There is this really good ice cream place. It is called Elevator. I don’t know why it is called that. We left yesterday. I mostly went to the pool. What’s on my mind is the earth day party. Today is the earth day. I got a bag at Safeway this morning. It is this girl named Laurel's bag. I don’t know who it is. I hope we have a lot of junk food. Candy, chips, and soda. The party is at 2:00. I love earth day. I love it because it celebrates the earth. We are going to have a earth day party because we dropped off the earth day bags to Safeway and we edited all the school's earth day bags. The PTSA gave a gift card from Safeway to by food for a party. You should always reduce, reuse, and recycle, especially on earth day. I think it is a really good idea because it teaches people about the earth. Earth day started on 1970. My dad was around. My dad was 8 when it started. I don’t think he remembers. My “Best of my Blog” is going really good. I have 10 articles. One of them is my Halloween stories. It is about a girl who sister gets taken by a zombie and the girl gets taken too. There is more to it but I don’t want to tell it. I have 59 articles. That is a lot. Some people in my class have some more than me. 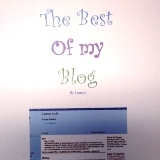 My book for Young Authors day is “The Best of My Blog”. It is the best 10 articles of my blog. It was so much fun putting it together. The hardest part of putting my book together was copying and pasting from my blog to Microsoft Word. It was not that hard but it was kind of hard. Mr. A took pictures of pictures we made. We made them with these really cool colored pencils. You dipped them in water and they look like paint. They are really cool. I like them a lot. My favorite way to cool off is going to the pool. I love going to the pool. My other way is to cool off is to go through the sprinkler. It cools me off a lot. I like to run through it really fast. What’s on my mind is the pool party. It is next Friday. I am so excited. It is going to be so much fun. I wonder what’s going to happen. Also what’s on my mind is Renton Water Park. I took Summer there. I love it there. There is so much fun stuff to do there. There are 2 slides, 1 lazy river, 1 wave pool, 1 pool and playground with water. It is so much fun. I am going to take Summer there again. What‘s on my mind is my reading group party. I forgot to bring plates for it. I was supposed to bring them. But I am  that we get to watch the movie Holes. It is such a good book and movie. I don’t think Ms Salter will get mad at me. I am so excited . At first when I got my blog I was so excited. I was nervous too. I did not know what to do with it, but now it is really fun. I want my teacher to be Ms. Sato. She seems to be nice and funny. My friend has her and she likes her a lot. She says she can be strict sometimes. But other times she can be really nice. I will miss Mr. A. He been such a good teacher. He has taught me a lot of stuff. I remember the first day of 3rd grade. I was scared. But I knew it was going to be O.K. But I am going to have a really fun summer. I think both of the teachers are good. But I want to have Ms. Sato. I will also miss Mr. Larsen. He is leaving this year. He student taught when I was in Kindergarten. He was really good. I can not believe that summer is here. I have wanted so long for it. I am sad because I left 3rd grade. Mr. Ahlness was such a good teacher. But when the beginning of the school year comes I probably will be ready for it. I don't know. I don't want to think about it now. My school got out on the 19th. It was going to get out on the 17th, but there were 3 snow days. I love summer because you don't have to go to school. My mom told me that some schools in different states that they go to school three weeks at a time so they kind of have school in the summer. I don't know if that is true.